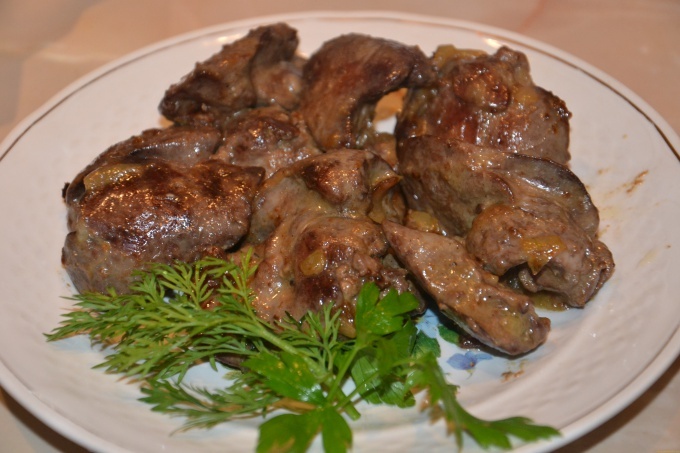 Dishes from chicken liver are delicious, tender and flavorful. And to this must be added that their preparation does not require any extra effort or time-consuming. For cooking perfectly tender chicken liver only need chilled. Frozen liver is not suitable. A dish of frozen liver is just going to stew in its own juice, then chilled as the liver will keep all the juices inside, creating a ruddy, thin crust. Before you fry the liver, it should be dried with paper towels or napkins. But in any case, before frying it is not necessary to add salt, otherwise it will be juicy and Golden brown will not work. On a hot pan the liver is laid out only one by one one by one. You need to avoid a catastrophic situation, when the entire liver mass is on the frying pan in a moment. This will dramatically lower the temperature of the pan, whereby the dish again would be to stew in their own juice. While cooking the liver, it is important to check the degree of readiness. This can be done by pressing on the flesh with your finger. The structure is ready to the liver should be slightly denser crude, but when pressing it prominaetsya inside. A firm liver suggests that it was overcooked. To make it easier to determine the readiness of the liver to the touch, you press on it with your finger still raw. Chicken liver product is very gentle, but because she will continue to prepare even when you turn off the heat under the pan. Ideally, the liver need to shift into another bowl and when the sauce in the pan podostynet, to get her back.